Pouring rain and strong winds didn’t deter the Shoes Brigade from turning on the fireworks to close-out the March contest. Overhead rights and lefts on the Reef and in the Ally were shreded time and again by competitors in all divisions to serve up one of the best and most dramatic tournaments in a long time. Every manoeuvre in the book was unleashed to gain supremacy. Off the back of exciting wave riding by the Shoes team at the Help a Mate contest at the Ally last weekend, every heat went down to the wire. 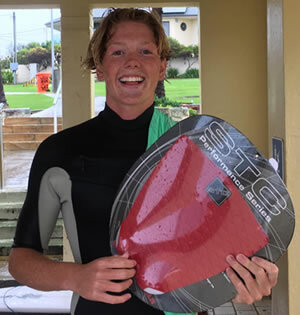 Luke Wedesweiler came home like a runaway truck to claim first place in the Open division, just edging out Reece Moffat, Jetson Kuch and Blake Sawtell. In the Juniors, it was a fabulous battle of the brothers, with Marley Moore edging out Finlay Moore, followed by Alec Durante and Ethan Shipley. The Masters showdown was fought tooth and nail, with Critta Durante coming home first ahead of reigning Masters Champion John Bonello, followed by Marty Shipley and Guy Turner. The weather may have been poor, but the buzz in the Pavilion throughout the contest was super high. Typically, Shoes members just kept charging regardless, setting the scene for the April showdown, which has the two dates of 6-7 and 13-14. The contest proved the point that the Shoes team can turn on wave-riding that the WSL Tour can only dream about. And that the weather and the challenging surf conditions buoyed by enthusiasm are always on display with a smile never a bad word!